For some time I had been considering activating another couple of Summits in the Woomargama National Park and following some checking with the topographic maps and Google Earth I decided to have a go at Munderoo, VK2/RI-005. 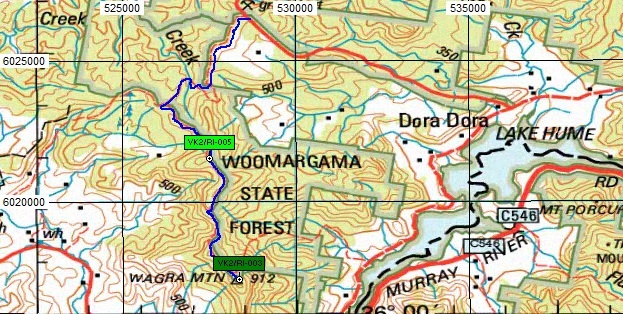 The NSW National Park map of the area shows a locked gate at Munderoo closing the trail to vehicle access to Wagra Mountain, VK2/RI-003, so I thought the activation of Munderoo could include a reconnaissance of that and, if the gate proved not to be there, then a further activation of Wagra would also be possible. Access to Munderoo is quite straightforward, following Hanels Road from Tunnel Road to its intersection with the Wagra Link Trail and then following that onto the Wagra Trail which crosses the Munderoo Summit. Hanels Road itself is dirt and is poorly maintained, with deep wash-outs and plenty of potholes. On reaching the Wagra Link Trail we were delighted to discover that someone, perhaps the Rural Fire Service, had been through with a bulldozer and levelled the trail. There is evidence that before this it had become somewhat overgrown, but now it’s clear apart from some remaining large rocks embedded in the surface. Carefully driven, a 2WD vehicle could get to Munderoo though much of the trail is clay and would become extremely slippery in the wet. The Summit of Munderoo is obvious and there are plenty of trees available as antenna supports. Beneath the trees there is quite a tangle of fallen branch debris so we found the best place to set up was close to the trail where the ground was relatively level and uncluttered. Once on the air I found that there was enough of a 3G signal to post a spot, and soon got going on 7MHz. In about 30 minutes operating I worked VK3PF, VK5LY, VK2YK, VK3ANL, VK1MA, VK1NAM, VK1GG/2, VK5PAS, VK3EK/P (S2S), VK3FQSO, VK5CZ/P (S2S), VK2LAX, VK3BD, VK1DI, VK2IO, VK2DDS, VK2TWR/P (S2S) and VK2DMT/P (S2S). Signals were up and down with a fair bit of deep QSB on signals beyond about 200km, but in the electrically quiet Summit environment everybody was easy to copy. From Munderoo the trail continues in a southward direction, diving steeply downhill. From Munderoo we could see no sign of a gate, so we continued onward following the trail. 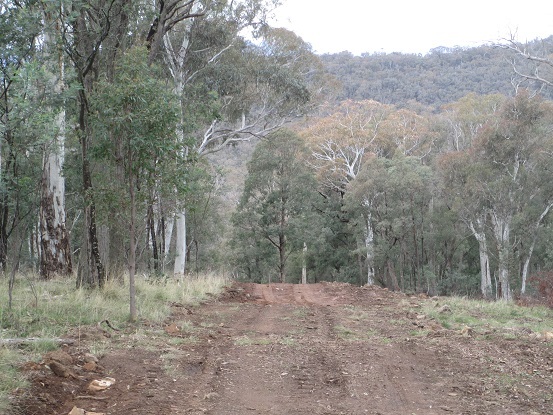 It’s about 5km from Munderoo to Wagra Mountain and the trail is very steep in places, though the bulldozer had made a good job of clearing and levelling the surface. The surface is clay and would be very slippery in the wet, but in dry conditions I would expect a carefully driven 2WD vehicle could get through. There are some “speed humps” to negotiate but none of them are particularly steep and none have a deep ditch on the uphill side, unlike some others we’ve come across. We reached the Wagra Mountain Summit without drama, having seen no evidence of a gate, locked or otherwise. As with Munderoo, the Wagra Summit is obvious and there is a large cleared area that looks as though it has been used as a camping site, though probably not in recent years. There are great views along the Murray River valley in both directions, if you take the time to stroll through the trees to the edge of the escarpment on either side. It’s worth the effort! 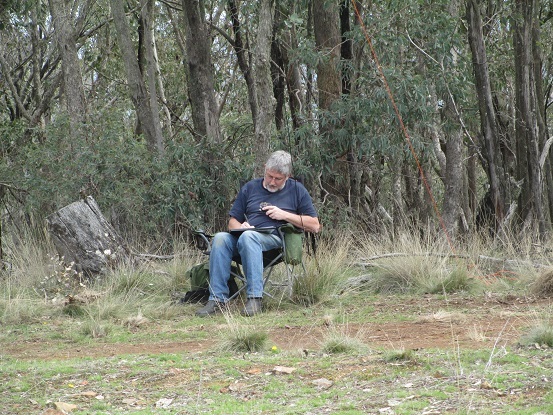 Wagra has plenty of handy gum trees with convenient branches for hanging the antenna, and there’s also a sniff of a 3G signal so that posting a spot is possible, though you might have to move around a bit to find the optimal place. My iPhone was having one of its increasingly frequent conniptions and refused to talk to anyone or anything, but fortunately I’d brought the iPad along as well and it happily posted a spot for me. Starting as usual on 7MHz I worked VK1MA, VK3PF, VK3ANL, VK3XL, VK3FQSO, VK3FPSR, VK2IO, VK3UBY, VK5ZGY/M, VK5LY, VK2KTT and VK2TWR/P (S2S). Glancing at the iPad I noticed a spot from VK6MB saying that he couldn’t hear me on 7MHz and asking if I had any other bands available, so I quickly popped out the antenna links, went up to 14MHz and posted a spot to say I was there. On 14MHz I worked VK6MB, VK6NU and VK5WG. When it went quiet again I moved back to 7MHz and worked VK3XPT/P (S2S) for the final contact of the day. On the way back down we decided to follow the Wagra Fire Trail rather than the Wagra Link Trail, mostly for a change of scenery. It, too, has had a visit from the bulldozer and is clear, though steep in places. It passes through some beautiful eucalypt woodland and the valley where the trail crosses Spring Creek is a particularly lovely spot; well worth the extra ten minutes driving time to check it out. 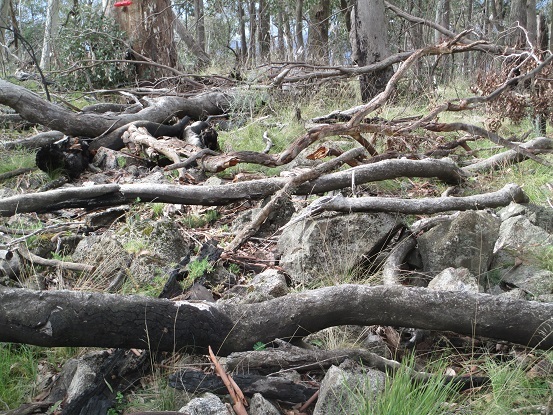 Don’t let the NPWS put you off! It’s worth exploring a little to see if what the map tells you is true. It’s worth keeping an eye on SOTA Watch if you can, as the spots often contain useful information. Thanks for the details, I plan a activation on Wagra mountain soon. I went for a drive up Hanels Rd today, looks promising. It’s a fairly easy run all the way through to Wagra Mountain. A little steep in some places and there are a few “speed humps” but otherwise no problems. There are suitable trees on both Summits if you need them to hold your antenna up. Good luck and I hope to make contact with you when you’re up there. Yes indeed, and mostly they work very well in protecting the trails from getting too badly washed out. They can be entertaining things to drive over, when you can’t see what is on the far side until you have dropped over the crest!